There will be a General Membership Meeting on April 12th at 4:45 pm. Location has yet to be determined. We will send out an update as soon as we decide. At that time we’ll also send out the agenda. We will be sending out the gist of the meeting afterwards for those unable to attend. Educators, school support staff, and service personnel stood together and achieved an impressive victory for West Virginia’s students and communities. They united across all 55 counties and achieved real changes that will help attract and retain the best teachers for the state. This includes a 5 percent pay raise that will go not only to educators and school service personnel but also to state troopers and ALL public employees. NEA Vice President Becky Pringle and I were in Charleston several times during the nine-day strike. We were inspired by the passion, dedication, and concern of the educators, parents, and students who showed up at the State Capitol. They met with legislators. They locked arms. They chanted. They sang. They stood strong. And they won. They are an inspiration to educators across the country, and this victory is a reminder of what we can achieve when we raise our collective voice. I am so proud of West Virginia educators and the West Virginia Education Association. 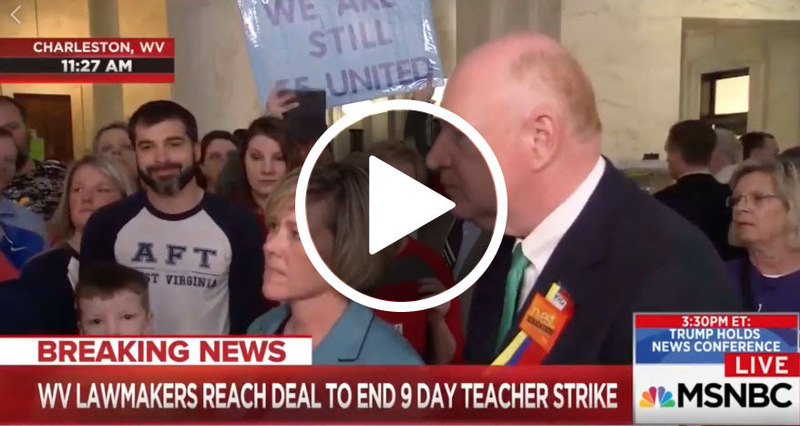 They stood united and made their voices heard to demand recognition of their professionalism and dignity because they know attracting and retaining the most caring and competent educators for West Virginia students is essential to their state’s success. These wins are impressive but we aren’t done yet. West Virginia still needs to make additional changes to ensure they can recruit the best educators in the future, including stabilizing health insurance costs. In Oklahoma, where teacher pay is the second lowest in the country, a proposal to give teachers a modest raise for the first time in 10 years failed in the legislature last week. And, a handful of greedy CEOs and special interests are trying to limit educators’ freedom to join strong unions with a court case, Janus v AFSCME, which the U.S. Supreme Court will decide this spring. Congress needs to complete work on the budget for the remainder of FY2018 by March 23, the deadline set by the two-year budget agreement reached earlier this month. The current focus is divvying up the funding pie – determining how much to spend on individual programs. We need to keep advocating for more education dollars, including significant increases in Title I, Title II, the Individuals with Disabilities Education Act (IDEA), and other programs that target the students most in need. Click on the take action button and urge Congress to invest in education. April 20, 2018 – the 19th anniversary of the Columbine massacre – will be a national day of action against gun violence. Inspired by the courageous students of Parkland, Florida, educators and families all across America are renewing their call for common-sense steps to keep our schools and communities safe. For information on events in your area, go to http://protectourschools.com. And click on the take action button to urge members of Congress to take common-sense steps to prevent gun violence – now! 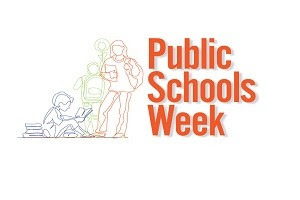 NEA, partner organizations, and members of Congress will observe Public Schools Week, March 12-16, by celebrating the students and educators all across America who make public education work. Highlights will include one-minute floor speeches about the great things happening in public schools in different congressional districts, a press conference with the six congressional co-chairs of the event, a tweet storm in appreciation of public schools, and a panel discussion of funding streams and how they impact students. For more information and a toolkit that includes images, a sample press release, and sample tweets, visit http://lovepubliceducation.org/public-schools-week-toolkit/. Thousands of working people rallied on the steps of the Supreme Court and around the country on Feb 26 as the justices heard oral arguments in Janus v. AFSCME Council 31, a case with far-reaching implications for working families and the entire labor movement. 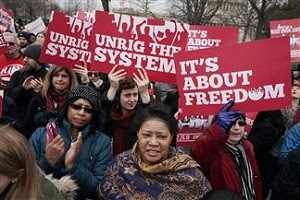 “The corporate special interests behind this case are dead set on eliminating the rights and freedoms of working people to organize, to negotiate collectively and to have any voice in working to better their lives,” said NEA President Lily Eskelsen García. “This is a blatant slap in the face of educators, nurses, firefighters, police officers and all public servants who make our communities strong and safe.” The Supreme Court is expected to issue a ruling by late June or early July. Inspired by the courageous students of Parkland, Florida, educators and families all across America are renewing their call for common-sense steps to keep our schools and communities safe. Meanwhile, President Trump proposed arming teachers who are “firearms adept & have annual training.” NEA President Lily Eskelsen Garcíaresponded, “Parents and educators overwhelmingly reject the idea of arming school staff. Educators need to be focused on teaching our students. We need solutions that will keep guns out of the hands of those who want to use them to massacre innocent children and educators.” In response to this growing problem, April 20 will be a national day of action against gun violence. For details, go to http://protectourschools.com. And click on the take action button to urge members of Congress to take common-sense steps to prevent gun violence – now! 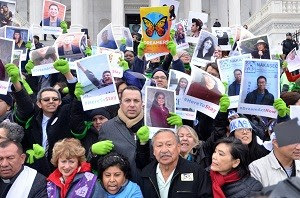 The Supreme Court rejected the Trump administration’s request to bypass lower courts and expedite an appeal hearing to end Deferred Action on Childhood Arrivals (DACA) on March 5. Two federal judges – in San Francisco and Brooklyn – have ruled that DACA must continue while the courts hear challenges to the president’s decision to end it. The appeals process could take many months, during which Dreamers will remain in limbo, which is why we continue to push for a permanent legislative solution. NEA supports the bipartisan Dream Act of 2017 (S. 1615/H.R. 3440) as well as immediate action to address the current crisis – for example, a Dreamer fix combined with reasonable border security measures. Click on the take action button and tell Congress to pass the Dream Act now! The two-year budget agreement reached earlier this month established overall funding levels. Now, Congress is focused on divvying up the funding pie – how much to spend on individual programs. We need to keep advocating for more education dollars, including significant increases in Title I, Title II, the Individuals with Disabilities Education Act (IDEA), and other programs that target the students most in need. Click on the take action button and tell Congress to invest in education.